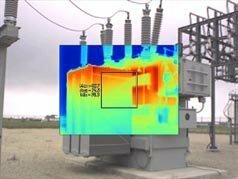 This is a synopsis of a case study that focuses on the role of thermal imaging in the predictive maintenance programs of Electrical Substations. Substations require a predictive approach to maintenance, as failure can be costly in terms of lost production and revenues and unreliable service. 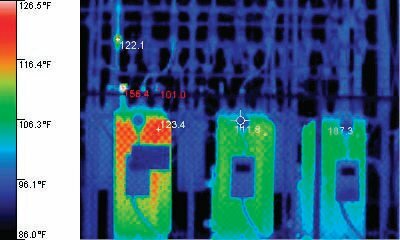 Degradation of an electrical component can show up as overheating and abnormally cool operating temperatures, and so require a test solution such thermography. A large electrical substation required predictive maintenance (PdM) for enhanced reliability and monitoring of equipment over time in order to isolate conditions that indicate impending failure. Their goal was to determine whether corrective action is required and, if so, to take that action before any equipment failure. The costs associated with a failed electrical substation depend upon many factors including the number and types of customers affected. Some estimates indicate that the average hourly cost of downtime across all industries could be as high as $950,000. As part of their predictive maintenance program, the Maintenance Team was advised to include thermography. Thermal imagers capture two-dimensional representations of the apparent surface temperatures of electrical components and other objects. Thermal Imaging Cameras combine a visual, or visible light, image with an infrared image for better identification, analysis and image management. The dual images are accurately aligned at any distance heightening details so problems are easier to spot. 70E provides additional specific guidance on procedures and the level of personal protective equipment required when inspecting substations. Thermal inspectors typically inspect transformers, regulators, switches, circuit breakers and capacitors among other components. The time of day is an important factor in collecting thermal images of substation components. Readings in the stillness of early morning may avoid the effects of solar reflections and wind, which can skew temperature readings. However, in pre-dawn hours loads are generally lighter and problems less detectable. The training and experience of the thermographer may also affect when outdoor IR scans should be performed. The Substation Maintenance Team has seen a sharp decrease in the failure of substation equipment, and a sharp increase in the timely identification of faulty equipment- resulting in less downtime for the electrical substation over a measured time period. Take a look at our range of Buildings Thermal Imaging Cameras and Industrial Thermal Imaging Cameras from FLUKE and FLIR. You might also be interested in receiving Thermal Imaging Training or booking a Thermal Imaging Survey. Contact us with any questions you may have, we’re happy to help!